A two-page ad in a posh lifestyle magazine is yet more evidence that another surrender to the morons among us is inevitable. The ad features three smiling women sipping glasses of wine. The background focal point is the backs of three pancho-clad men standing in a drenching downpour watching a baseball game on a large screen TV. The company’s website says its outdoor TVs start at $2,095 and “are engineered to resist rain, dust, humidity, insects and salt air.” Internal heating and cooling features guarantee the TVs will run in temperatures ranging from 40 below- to 122-degrees Fahrenheit. That means, given a long enough extension cord, these are the first TVs built to accompany explorers like Lewis & Clark. Yes, we can now watch television outside in weather severe enough to send cows shuffling off towards the barn. I enjoy going outdoors to see what I can’t see indoors, things like trees, blue sky, stars and birds. We have a great back porch looking out into the deep forest of Western Pennsylvania. Some of my favorite times are spent on that porch reading, grilling and just enjoying the solitude. From that porch, I’ve seen deer, bear, foxes and once had the good fortune to spy a wild turkey while sipping Wild Turkey. The coincidence was only slightly more rare than seeing Jack Daniel, now dead 100 years, while drinking Jack Daniel’s. That’s happened to me, too. You’d be amazed at some of the stuff I’ve seen while drinking Jack Daniel’s. If we had a TV out there, I’d go outside for some soul-nourishing solitude and find my daughters out there watching something like “iCarly” on the Disney Channel. The blasphemy would mean I’d again be forced to consider leaping from eight days to Amish straight to actual Amish. And I’d miss things like the hockey playoffs, The Masters, “Survivor,” and other televised entertainment I’m guessing are shunned by actual Amish. The porch is maybe the one place I can go where there’s no threat of being exposed to televised entertainment. We now have TVs in fast food restaurants, in elevators, on the back of airplane seats and in places where we wait to get our teeth cleaned and our tires rotated. And the number of TV screens we encounter on any given day is in inverse proportion to the amount of programming there is worth watching. I’ve never once been in the vicinity of a public television where anything was on I wanted to keep watching. It’s usually news or talk shows, the vanilla ice cream of TV viewing fare. It’s meant to appeal to the lowest common denominator. It’s that way, too, even in sports bars where the screens often outnumber the patrons. I’m fine with that most of time. I enjoy watching sports. But most of the time it’s shows about people talking about watching sports. Putting all-weather TVs outside is another way in which we are extinguishing our ability to imagine anything other than what we’re shown. 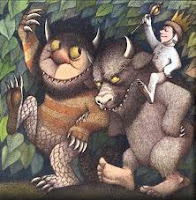 I like to think I have a vivid imagination, sort of like Max from the Maurice Sendak 1963 children’s classic, “Where the Wild Things Are.” In the book Max misbehaves and his overwrought mother sends him to his barren room without supper. Apparently Max was born before Ritalin and other psycho-stimulants were routinely prescribed. A great adventure ensues all within the confines of his mind. His room becomes a wilderness and he sails across a stormy sea to an exotic land where the Wild Things are. It’s a story that couldn’t be written today. Guaranteed, Max’s parents seem like the kind who’d be sure to put a TV in young Max’s room for when the rigors of parenting become too much. And even if Max thought to conjure a magical land inhabited by crazed creatures, thanks to SunBrite weatherproof TVs, rain or shine, the Wild Things would all be too glued to the tube to bother messin’ with Max.